The world of medicine is conservative, dogmatic and slow to change. This attitude is understandable, given that patients entrust their lives and wellbeing to us. However, being slow to change is also a risk for patients. History has taught us that questioning ourselves and standing up to dogma can save countless lives. But how you choose to communicate your thoughts and discoveries can significantly impact the outcomes. Consider 2 major figures in the annals of medical breakthroughs: Andreas Vesalius and Ignaz Semmelweis. One succeeded at turning over a lifetime of medical dogma, whereas the other failed. Joseph Lister, with help from Louis Pasteur, is widely credited with disseminating germ theory and pioneering antiseptic techniques. However it was Semmelweis, a Hungarian physician in the 1800s who first proposed antisepsis and peripherally discovered germ theory. Semmelweis was assigned to work in the First Obstetrical Clinic of the Vienna General Hospital, where in exchange for free services physician trainees were allowed to practice on them. Semmelweis was puzzled and disturbed to learn that the maternal mortality rate, due to a condition known as puerperal fever, was double in the First Clinic when compared to the Second Clinic. This was so well known that patients would fake giving birth in the streets to avoid being admitted to the First Clinic. Semmelweis arduously tried to determine what could account for the difference until a tragedy inspired his eureka moment. A colleague stabbed himself during a cadaver dissection, and subsequently died from an infectious disease. The ensuing autopsy revealed pathology very similar to that of puerperal fever, and Semmelweis finally was able to connect the dots. Trainees in the First Clinic were going from cadaver dissections to births with “cadaverous particles” on their hands that was causing this illness, while midwives who were trained in the Second Clinic did not have this issue. He performed an experiment where he had trainees wash their hands with chlorine before attending deliveries and the results were astoundingly positive. Semmelweis and his students jumped to publish their results and correct a major error among the medical community. What they did not anticipate was the various cognitive biases and stakeholder issues that would push back intensely against these new thoughts. Not only that, Semmelweis’s results were poorly communicated, leading to widespread misunderstanding and further loss of credibility. Ultimately, Semmelweis’s correct and groundbreaking findings were rejected by his own community. He eventually suffered from a severe emotional breakdown, was institutionalized, and died tragically — and ironically — from an infection. It would be nearly 2 decades after Semmelweis’s initial discovery that Joseph Lister successfully performed the first antiseptic surgical procedure and successfully disseminated germ theory and antiseptic techniques. If you think the medical community of Semmelweis’s time was slow to change, you will be surprised to learn it was an exponential improvement from the age of Galenic medicine. Galen of Pergamon was a greatly influential Greek physician, researcher, and philosopher in the Roman empire. While many of his discoveries hold weight to this day, many were remarkably inaccurate, such as his extensive anatomic writings were based on the dissection of monkeys. At the end of his career, Galen pronounced that he had discovered all that there was to know about medicine, and that no further research was required. Galen died around 210 AD, and for about 1300 years, people believed him. Vesalius was a gifted Flemish physician. Upon receiving his medical doctorate, he was immediately offered a position as chair of surgery at the University of Padua. He was quickly shocked to learn that students at the time learned mainly by reading and watching barber-surgeons dissect animals, rather than performing dissections themselves. Vesalius insisted that his students perform their own dissections, and not only that, perform them on humans, a major taboo at the time. During the process of these dissections, Andreas started to note many anatomical features that contradicted Galen’s teachings. When he dug deeper, he discovered that Galen had never performed human dissections. He took upon himself the tremendous task of overturning these established teachings, doing so not by telling people they were wrong, but by offering them a compelling resource: De humani corporis fabrica. Vesalius had noticed that illustrations he had commissioned of his dissections were in such high demand that counterfeits had to be made satisfy it. Utilizing the effectiveness of the illustration medium, Vesalius published Fabrica as his seminal work that was an irresistible and beautiful work, but also effectively subtly overturned Galenic teachings. The final strategy Vesalius used was to give people the ability to confirm the truth themselves. Through Fabrica he gave them a method and a guarantee, that if they performed their own dissections they will find that his teachings are accurate. Vesalius wasn’t the first person to try and overturn Galen’s teaching, but he was the only one that was successful. Unlike Semmelwies, Vesalius understood not only the clinical problem, but also the stakeholders involved, and had mastered the methods of mass communication available at the time. Vesalius wasn’t afraid to speak truth to power, but what he chose to say and how he said it made the difference. 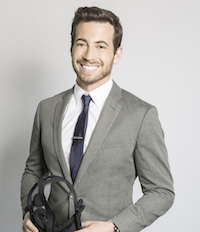 Justin Barad, MD is the co-founder and CEO of Osso VR, a clinically validated and award-winning surgical training platform. He is also an orthopedic surgeon with a Bioengineering degree from the University of California Berkeley, and an MD from University of California Los Angeles.